No part of this report to be reproduced or referenced without appropriate citation to this report. Over the past two years, we have carried out an international study of Protection Gap Entities (PGEs) – those organizations and initiatives that operate between governments and markets to develop novel financial solutions that mobilize (re)insurance capital in addressing the aftermath of natural and man-made disasters. The economic and social impact of disasters has been growing steadily over the past decades, and yet it is estimated that, globally, 70% of the economic losses from such disasters are not insured. The lack of insurance lays the burden of financing reconstruction on the shoulders of cash strapped governments, international organizations, and in many cases, ultimately, the victims. The limitations in accessing such financial resources delays recovery and exacerbates the negative consequences of disasters. PGEs are increasingly seen as a key instrument to address this problem. Their broad goal is to transform uninsured risk into insurance-based products that can be transferred into global financial markets or on government balance sheets to provide capital for recovery following a disaster. PGEs differ considerably in governance structures (e.g. public, private, partnership), risks covered (e.g. single peril or multi-peril), type of risk solution (e.g. product used) and their funding model (e.g. policy holders’ premiums, public or private levy). To investigate their common features, as well as their differences, we have studied 13 PGEs across 23 countries in detail (see box for an overview of our study). We found that, despite the differences, some core themes can be identified across PGEs. Objective 1: Resolve disruption in (re)insurance supply in mature markets. Such disruption can be the result of extreme events that cause unexpected large losses that jeopardise (re)insurers’ capital reserves and reduce confidence in the ability to quantify and manage exposure for a specific peril. For instance, the California Earthquake Authority (CEA) was set up to address the withdrawal of insurance from the residential property market following the 1994 Northridge earthquake. Objective 2: Mitigate the threat of unaffordable insurance in mature markets. The combination of more frequent extreme weather events, high levels of urbanization in weather-exposed areas, and increasingly sophisticated risk modelling that pinpoints risks at an ever-higher level of detail has resulted in a growing number of insureds falling into the 'high-risk’ category. Insurance products, priced to reflect high-risk, may 'price out’ potential policyholders, creating a social problem. This objective was behind the creation of, for instance, Flood Re in the United Kingdom, with a remit to ensure availability of affordable flood insurance for residential properties. Objective 3: Increase the financial viability of sovereign states with fragile economies and little insurance penetration. Here, PGEs typically aim to provide a rapid injection of cash in the aftermath of disaster to ensure the continuing operations of key government services such as the health service, as well as fund the immediate relief efforts. This approach differs significantly from the reconstructions aims of insurance products in more mature insurance markets. An example of this type of PGE is African Risk Capacity (ARC) which provides parametric insurance products designed to improve responses to climate-related food security emergencies, such as droughts. While PGEs have common broad objectives, many specificities arise because establishing a PGE is inevitably a complex and sometimes protracted process. It requires negotiations between multiple stakeholders - such as various government departments, intergovernmental organizations, (re)insurance companies, brokers, and modellers - that have different worldviews, different technical understanding of risk, and crucially, different interests and different social and commercial objectives. The establishment of a PGE is thus, often an 'uneasy’ truce between these stakeholders. This, combined with the well-known legal and cultural distinctions of individual countries, contributes to the significant diversity across PGEs. Types of market intervention: how they share risk with existing market players. Positions in the value chain: where they sit within the value chain for risk transfer. Our research study shows that PGEs emphasize primarily either 1) removing risk, or 2) redistributing risk as their key means of market intervention (see figure). Removing risk refers to a market intervention in which risk is taken away, totally or partially, from the market and put onto the balance sheet of the PGE or the Government (vertical axis in the figure). This is particularly likely for risk that is seen as too volatile or extreme for the market to take, such as the threat of what is termed non-conventional or chemical, biological, radiological or nuclear (CBRN) terrorism, where the potential losses are beyond the capacity or risk appetite of the market. These are the situations where lack of intervention would lead to a withdrawal of (re)-insurers from the market, and therefore is particularly common when PGEs are set up to pursue Objective 1. 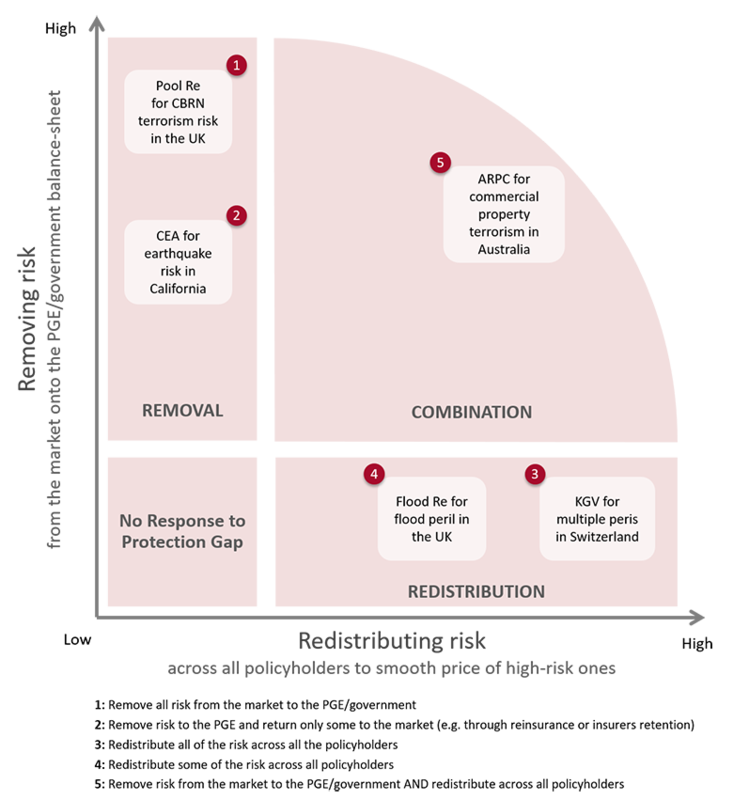 Redistributing risk refers to taking the risk of loss by a relatively small group of highly-exposed policyholders and sharing it across the wider pool of variably-exposed policyholders (horizontal axis in the figure). It is typically used in situations where risk-reflexive pricing makes insurance unaffordable for policyholders in highly-exposed areas (see Objective 2). Removing and redistributing risk are not necessarily either/or responses. As indicated by the Figure above, PGEs can combine risk removal and risk redistribution, albeit not necessarily in equal measures, or on the same elements of risk. Rather they may take an approach where they remove some elements of risk and redistribute others. While these interventions can be effective in the pursuit of PGE’ objectives, they also present challenges. Removing risk, especially over a prolonged period, can weaken the appetite of the market; as competencies to assess and trade that specific risk are lost and companies are reluctant to invest in redeveloping them in the absence of a significant market. When risk removal is only partial, the challenge lies in the market cherry-picking the most profitable risk, leaving the PGEs (and by extension, the government and tax payers) to absorb the losses of the body of highly exposed risk that does not yield sufficient volume or price to be profitable for the industry. While this allows the market to work for the remaining risk, it poses issues of market subsidisation and social fairness in relation to whether some groups of highly exposed citizens should be subsidized by others. Redistributing risk carries its own challenges, primarily because, by smoothing the price differences between high-risk and low-risk areas, it reduces incentives to mitigate risks. Those at the highest risk of repeated loss are not incentivised to reduce their risk, or change risky behaviours (for example, through structural changes to their property to mitigate the effects of flood), since they do not bear the full costs of their exposure. In addition, redistribution only works if high-risk insureds are a small proportion of the total pool of insureds. However, as climate change and growing urbanization increases the exposure to disasters (both in geographical scale and intensity), risk redistribution can become increasingly difficult to sustain for certain risks, such as flooding. The premiums of the many may no longer necessarily outweigh the losses of the high-risk insureds. Whatever combination of risk removal and redistribution PGEs choose to employ, they do so from a specific position within the risk value chain. In our research, we have identified three main positions that PGEs can occupy. These positions are archetypes, meaning that they illustrate general characteristics of occupying that space in the value chain. The reality of any particular PGE may differ slightly from the archetype. Source: Jarzabkowski P, Chalkias K, Cacciatori E and Bednarek R (2018). Between State and Market: Protection Gap Entities and Catastrophic Risk. London: Cass Business School, City, University of London. p. 16. Insurer PGEs provide insurance policies directly to insureds in return for a premium, and may buy reinsurance on the private market to cover their risk exposure. Such PGEs can provide cover for a risk that is no longer taken by the market (Objective 1); or one for which cover has become unaffordable for those highly exposed (Objective 2). Examples of Insurer PGEs include the New Zealand Earthquake Commission (EQC), the California Earthquake Authority (CEA) and the U.S. National Flood Insurance Programme (NFIP). This position is typically taken by PGEs offering homeowner policies and involves a combination of collaboration and competition between the PGE and commercial insurers. Typically, Insurer PGEs develop their own insurance policies on the risk they deal with and offer them to policyholders via traditional insurers. Homeowners often buy their insurance as a 'bundled’ product that covers them from the risk of fire, flood, or earthquake, alongside other perils. Such policies provide a catch-all of potential risks and, usually, provide the necessary protection of assets to underpin a homeowner’s mortgage. In some situations, the cover is provided exclusively by the PGE for a given peril (e.g. earthquake in New Zealand via the EQC), while in others, insureds can choose between the product offered by the PGE and those offered by the private market (e.g. earthquake in California via the CEA). Best For. The Insurer PGE archetype is best for ensuring personal lines cover to citizens where a region is heavily exposed to a key peril, such as earthquake or windstorm. It can ensure that all members of a society have access to homeowner insurance that could otherwise be unaffordable for some. It may be particularly effective for the risk redistribution strategic response, especially where cover is either mandatory, or required by lending institutions in order for policyholders to obtain a mortgage. A Reinsurer PGE reinsures risk that is transferred from the primary market. However, it may also transfer some portion of that risk into the commercial reinsurance market as a retrocession product, or even to the government balance sheet. This position in the value chain can address a supply failure in the secondary market (Objective 1) as, for instance with Pool Re in the UK, which was born when reinsurers withdrew from the commercial property market after terrorist attacks in the early 1990s. A Reinsurer PGE provides the necessary capital backing for the primary market to keep trading in a particular risk for which there is insufficient reinsurance capital. a.The sole reinsurer in the country for the personal lines related to the risk. This allows the PGE to pool the risks across the whole country, thereby making it possible to offer a lower average price. In turn, this allows insurers to lower their prices for the high-risk insureds. This is, for instance, the case of Caisse Centrale de Reassurance (CCR) in France. b.The reinsurer for the most highly-exposed risk. In this scenario, insurers charge an affordable, below-market price to high-risk policyholders and transfer these policies to the PGE. These schemes are then financed through some form of compulsory payment mandated by the state. In the case of Flood Re in the UK, for instance, a levy is raised on all policyholders, collected by the insurers and passed to Flood Re to grow its capital reserves. Best For. Reinsurer PGEs can scale up or down their strategic responses of risk removal and risk redistribution, in line with the changing nature of the protection gap. While such strategic flexibility necessitates a skilful coordination of the interdependencies among stakeholders, who may have conflicting interests, the Reinsurer PGE can be an effective archetype for responding to fluctuations in (re)insurance capital, because of its position between the primary and secondary market. Source: Jarzabkowski P, Chalkias K, Cacciatori E and Bednarek R (2018). Between State and Market: Protection Gap Entities and Catastrophic Risk. London: Cass Business School, City, University of London. p. 18. This type of PGE 'captures’ risk throughout the value chain, operating in both the primary insurer and the secondary reinsurer spaces. It can act as a primary insurer for all, or at least most, risks in a country, either alongside traditional insurers as an additional product, or by 'co-insuring’ on existing products with the primary market insurers, to support the market’s ability to provide cover to and pay claims. This type of PGE is typically a public-sector organization with access to the government backstop to secure its balance sheet above the capital reserves it can amass through its privileged access to the primary market. An example of the Market Capture PGE is the Spanish Consorcio de Compensación de Seguros (CCS). A Market Capture PGE, in conjunction with a comprehensive national approach, can be very effective in providing comprehensive cover to all citizens at an affordable price. This presupposes that most citizens are insured, typically through some mandatory form of cover, and that any private sector insurance companies are co-opted into sharing risk with the public-sector PGE, for instance by bundling the PGE cover with their own policies. The Market Capture PGE enables the risk redistribution element of protection at the primary level, whilst enabling risk removal from the private-sector elements of the market at the secondary level. While the Market Capture PGE can be very effective in ensuring wide spread coverage, it comes with the risk of 'crowding out’ private sector provision. This happens in two distinct ways. First, when the Market Capture PGE manages the entirety of the risk, especially for long periods, private providers can lose or never develop expertise in trading that risk, and therefore lose appetite for such risks. Indeed, market players may end up ceding their entire catastrophic risk to the PGE, considering it in their best interests to protect their balance sheets. Such 'capture’ of market interests (2) can happen even where there are governance structures in place to ensure that the PGE responds to changes in risk appetite in the industry, and even where the two parties may feel they have independently negotiated their positions. Second, the Market Capture PGE does not need to access reinsurance, due to its comprehensive access to wide diversification, underpinned by a government guarantee.  At the same time, the international reinsurance market cannot offer cover directly to the primary market, because the primary market trades solely with the nationally-owned PGE. While this is beneficial from the perspective that the cost of buying reinsurance is avoided, it also hinders the inflow of capital from global markets to pay for national losses. Best For. The Market Capture PGE is a nationalized approach to the insurance market. It is the best for a country wishing to use insurance-based mechanisms to provide comprehensive cover for its citizens, and to control the pricing of that cover. It is thus effective where cover is largely compulsory and where the primary aim of the PGE is to bridge the protection gap by ensuring that citizens have the maximum access to widespread cover. It is particularly suitable for political economies and historical contexts in which there is a nationalised approach to public goods and facilities. PGEs also perform a range of functions that go well beyond the narrow objective of transforming risk that is perceived to be uninsurable into insurance products traded on the market. These functions, while not necessarily part of their formal remit, are nonetheless central features of PGEs’ role in the efforts to address the protection gap. As explained, PGEs come about as part of an 'uneasy truce’ among a range of stakeholders, all of which have different objectives and interests in addressing a protection gap. Because of the process through which they are established, PGEs have a central position with direct ties to these multiple stakeholders. Being at the nexus of the stakeholders, PGEs become a centre for debate or informed dialogue amongst them. 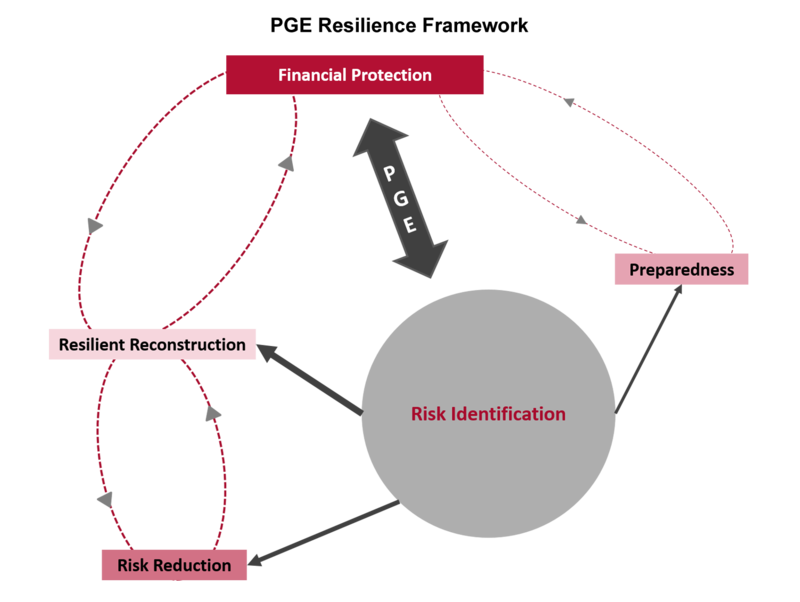 PGEs, therefore, become critical actors in framing the evolving understanding of the protection gap, such as what risks remain under-insured, how they might be addressed, and who should be responsible. PGEs need to trade risk that is either not insured, or on the verge of becoming uninsured due to high premiums. A new understanding is needed in order to find a rationale on which to trade - and PGEs must therefore develop new technical expertise, or co-ordinate and use existing expertise in new ways which may not have been available to the market. PGEs therefore have an incentive and indeed, a unique position in filling a knowledge gap that often accompanies a protection gap. For instance, as part of its initial remit, Flood Re needed to quantify the potential number of properties at severe risk of flood in the UK. This entailed combining existing technical expertise on the UK flood peril from different parties including insurers, public databases, modelling companies and the Environment Agency. PGEs can address barriers to knowledge sharing, overcome knowledge deficits and develop a 'pre-competitive’ space for new technical expertise. However, they can also generate tensions between the open and proprietary nature of such technical expertise. This is because, as they usually have a public sector ethos, PGEs might opt for open-sharing of their modelling capabilities, in contrast to the private sector model in which data and models are usually owned and licensed. Source: Jarzabkowski P, Chalkias K, Cacciatori E and Bednarek R (2018). Between State and Market: Protection Gap Entities and Catastrophic Risk. London: Cass Business School, City, University of London. p. 25. The role of PGEs in contributing to improve risk identification is particularly important because it, in turn, underpins a range of other important aspects of resilience. For instance, the insurance industry might have loss data and/or the technical expertise to identify and calculate high-risk areas and consult on efficient ways of resilient rebuilding. PGEs have difficulty in implementing risk reduction measures, and ex ante retrofitting in particular, without legislative support. However, these same measures can be used in resilient reconstruction, where the PGE pays the claim on the proviso that rebuilding follows specific reconstruction codes. PGEs that provide insurance cover to highly-exposed properties may have a more direct influence over resilient reconstruction, particularly where the payment of claims may be linked to enforceable structural codes for rebuilding. Protection gap entities or stop gap entities? As explained, PGEs are often set up with one of three objectives related to a specific and local protection gap. These objectives emerge in the aftermath of major catastrophic events that promote political engagement and influence opinion in civil society. They thus form the basis of a remit around which stakeholders with diverse and sometimes conflicting interests can agree to join forces in setting up the PGE. The need to forge consensus in a short period of time in order to address a crisis means that a PGEs’ remit is often tightly constructed around the objective leading to its establishment; a stop gap for a particular problem. In such cases, PGEs, as initially set up, can provide only partial solutions to the protection gap. Thus, paradoxically, while PGEs can have a significant role in improving understanding of the protection gap by promoting debate across stakeholders as well as developing expertise, their institutional set up can significantly constrain any evolution to address either the underlying reasons for the gap or changing circumstances. Indeed, stakeholder attention, particularly political attention, moves on so that there is typically little will to address change until after another disaster exposes a new protection gap. Narrow and rigid remits can create problematic situations in which stakeholders assume the threat of a particular disaster has been covered (because the original remit has been met), leading to criticisms of the PGE when it is unable to respond to losses that were never in its scope. Think for instance of the challenge that the changing nature of terrorism, with the rise in lone wolf attacks, can pose to terrorism PGEs whose remit was devised at a time when the major uninsured terrorist threat was bombs in commercial buildings. Lone-wolf attacks typically cause very little or no damage to commercial buildings, but may cause significant loss of life and can have a huge economic impact on tourism, due to cancellations and last-minute changes by travellers concerned about the threat of terrorism. If the remit of the PGE is to cover only property damage caused by terrorism attack, no payments would be made. The non-cover of these financial losses does not make the PGE unsuccessful, since such losses were not relevant to its remit. Yet, ex-post, stakeholders, not to mention the public, may expect that this 'should’ have been the remit of the PGE. From this point of view, PGEs should be able to modify their remit to continue to address the gap. An opposing point of view holds that complex organizations have a well-documented tendency to 'mission creep’ – the expansion of the organization beyond its expertise or usefulness. These tensions around an evolving gap or a fixed purpose, need to be constantly monitored and managed by all PGEs. 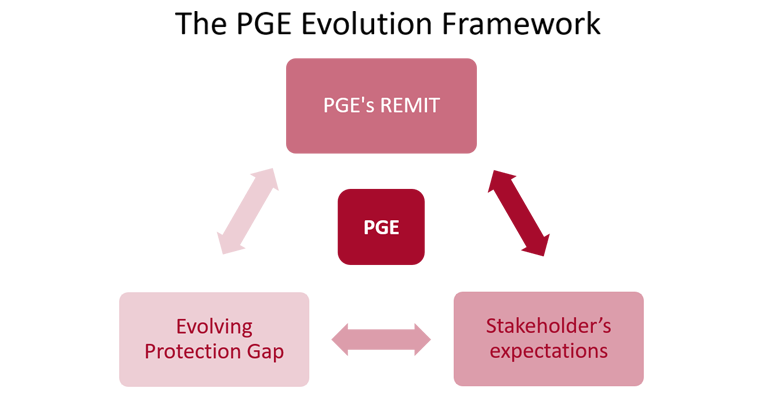 The PGE’s remit, the stakeholders’ expectations, and the evolving protection gap exist in a dynamic balance, as we depict in our PGE Evolution Framework in the Figure. Source: Jarzabkowski P, Chalkias K, Cacciatori E and Bednarek R (2018). Between State and Market: Protection Gap Entities and Catastrophic Risk. London: Cass Business School, City, University of London. p. 29. Ensure that the remit of PGEs is subjected to regular policy or legislative review, within an evolving policy dialogue among stakeholders. This might ensure the adaptation of the remit to changing circumstances and help avoid situations in which a PGE’s remit is adapted only in response to a crisis, after the fact. Clearly communicate the PGEs remit to stakeholders. The fact that the PGE deals with 'the protection gap’ can be confusing as that term is quite abstract. PGEs are formal organizations that have a set of specific goals to achieve in relation to a specific protection gap, rather than a mission to close the global protection gap. Thus, they need to define what constitutes success in terms of their remit, so that stakeholders can evaluate them based on this predefined set of objectives. Strengthen PGEs role in resilience, by giving them some formal powers (e.g. the option to mandate some form of resilient reconstruction for damaged properties), and enhancing links with government entities critical for resilience, such as land-use planning departments and civil protection agencies. The protection gap is a complex and challenging issue that is growing, both in its effects on local economies, and its impact on global capital flows. Our study provides some new insights about those PGEs that have been already established, from which to continue the dialogue between stakeholders about how the protection gap may be better addressed in different contexts. We hope that our research will be considered a 'call to arms’ to learn from, and make better use of these established PGEs, in order to better address the increasing threat of natural and manmade catastrophic disaster, and the growing protection gap. CCS, as relates to its coverage of catastrophic (or extraordinary risks), is in many ways a unique institution in the landscape of PGEs. It is one of the oldest, dating back from the 1940s, as well as one of the most comprehensive in terms of both perils covered and penetration. In terms of our framework, it operates by both removing the totality of the catastrophe risk from the market and redistributing it nationwide on the basis of geographically uniform premiums. It is also a representative example of the of Market Capture PGE archetype. As a comprehensive insurer it has the advantage of a very diversified portfolio and thus does not need to seek reinsurance on the secondary market. Over the years, its 'co-opetition’ with the insurance markets (CCS insurance takes the form of a compulsory addition to standard insurance policies in both commercial and personal lines) has allowed it to reach comparatively high penetration rates (7). CCS has effective institutional instruments to manage the tensions between its remit, stakeholders’ expectations and evolving protection gap through a board equally divided between representatives of the state and industry that would allow it to adjust the amount of cover it provides to the risk appetite of the market. At the same time, almost 80 years of heavy reliance on CCS for all catastrophic risk has led to a declining appetite for catastrophic risk from local market players. With thanks to our sponsors: Hiscox, Pool Re, Guy Carpenter, Willis Towers Watson, Bank of England. more than 9,500 pages of documentary data such as annual reports, press releases and media articles. other key protection gap actors such as independent consultants and resilience teams. The focus was thus not on any particular organization but on developing a holistic understanding of the particular local solutions to the protection gap via a multi-stakeholder approach.